We recently covered the launch of the Sky Skipper Project, which is an ambitious project by three retro enthusiasts - Whitney Roberts, Olly Cotton and Alex Crowley - to unveil a fully restored arcade cabinet of the game in 2017. 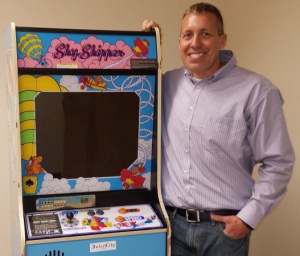 Sky Skipper was one of a number of arcades planned to arrive after the success of Donkey Kong. It was play-tested and marketed in the US but ultimately canned in 1982, making it immediately fascinating to retro arcade enthusiasts. Though ROMS have found their way online and the game actually has an Atari 2600 iteration, no complete cabinets are known to exist - only a very small number of PCBs. 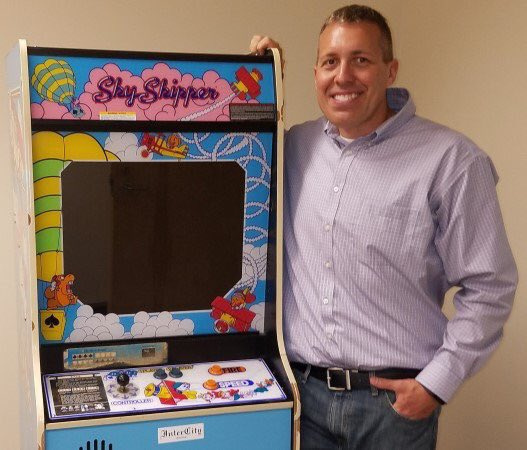 Whitney recently gained access to the only Sky Skipper arcade ever made which is hidden away at the vaults of Nintendo of America. The Sky Skipper Project team were able to spend several hours taking scans and photos of this prototype cabinet. The cabinet has the serial number 001 and was playtested at the nearby University campus in the early 80s, but unfortunately it wasn't a hit so plans to roll it out further were scrapped. This prototype cabinet is therefore the only one ever made. It's also going to be a massive help with the restoration project - before the team were granted access they had intended to use a promotional flyer as reference. There are only four known arcade circuit boards (PCBs) in existence. Alex Crowley found one in Sweden and another in the UK, converted to run Popeye instead. However, the serial numbers gave them away and with support of the retro arcade enthusiast community, it was possible to convert them back to play Sky Skipper again. One more turned up recently in the Netherlands on eBay, and of course the other one is at NOA. Who knows if any more will turn up? The grand plan now is to use these detailed photos and scans to reproduce the arcade marquee artwork and convert two Popeye cabinets - one located in the UK and the other in the US - to represent how this prototype in the vaults at NOA would have looked in all its glory. It's a great milestone in this story, we can't wait to see the two restored cabinets one day. God, I love stories like this! Who knows what else Nintendo has in their vault? Gets me all excited just thinking about it! From the main page it looked like one of those cutout cardboard TV screens you made as a kid. An interesting piece of Nintendo history. Didn't that game have a mild cuss word in the text somewhere? I wonder if this prototype would've edited that, being a US version. It is erroneous to claim that's the only Sky Skipper cabinet ever made, because it was released in Japan in 1981. Albeit most of them where quickly replaced with Popeye, I would be very surprised if there isn't alot Sky Skipper cabinets that's been stored away and forgotten. It would be very cool if they decided to release the scans and artwork to allow other arcade fans to re-create their own Sky Skipper cabs. It's unlikely, but one can hope! Either way, a rare move by NOA to let outsiders into the vault and share some Nintendo magic!! Thanks it's taken a lot of work to get to this point and it's very exciting seeing your positive comments. @NintendoVideoGa Are you saying the historian at NOA we spoke to is wrong ? This game in the picture is a prototype the game was never released. @chuckie-egg Sky Skipper was a noteworthy failure for Nintendi, but was nevertheless released in Japanese arcades. That picture however, is of a prototype US cabinet which was never released. The thing with arcade cabinets are that, like with ordinary consoles, their hardware needs to suit the country it's produced in due to different wall voltages and video formats. The US version of the Sky Skipper arcade cabinet was cancelled whereas the Japanese wasn't, much like the Chinese Wii was cancelled whereas the Wiis of other regions wasn't. This is a great find regardless. Here's hoping to see the full restoration soon! @TruenoGT I noticed a number of Midway games did that. Tapper, Timber, Journey, and ArchRivals for example. I checked out System16 and saw most of Midway's hardware ran at 512x480 throughout most of the 80's. On common 19" arcade monitors of the time, those would be considered super high res graphics versus the competition. Even in the 90's, other manufacturer's games ran at low res. The NeoGeo ran at 320x224, and early Sega Model 1/2/3 boards ran a bit under Midway's resolution, for example. Actually, I didn't notice higher resolutions, at least 640x480, in the arcade until the end of the 90's with Sega's Naomi games. With The House of the Dead II, Crazy Taxi, Confidential Mission, et al. @NintendoVideoGa until a Cabinet turns up in Japan I'll go with what the Historians at NOA have confirmed.